While we are entering into our “leaf season” for the mountains of Western North Carolina, we have also seen a great change in the real estate market. Hey, it’s about time. 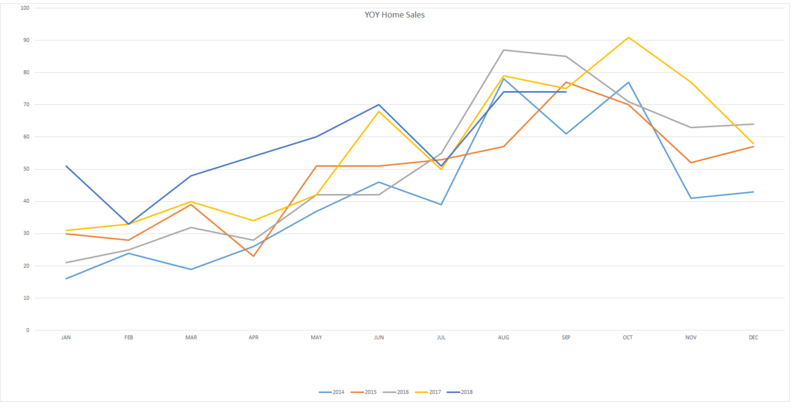 The last several years things have been pretty slim as far as home sales in the area. Yes, home sales had continued, but certainly not at the pace for many previous years. Some brokers took this opportunity to lose a little excess weight. No more eating out with clients. Couldn’t afford too! We went from Ribeye’s to hog jowl’s. Okay, maybe it wasn’t that bad, but it was slow. About September of 2017, home sales in Highlands/Cashiers area started to take a turn for the better. For the most part, that trend has continued up until now. Even now, we are basically even with September 2017, but overall 2018 has been the best we’ve seen in many years. Agents are busy and some have even said they’d like to take a break. Well, as we enter the slower months of the year, they may be surprised that they may get that break soon enough. We typically see home sales drop off in October and November. Keep in mind that these sales probably went under contract in September some time. One could deduce from this that the majority of our “selling season” will taper. Still, there are Buyers out there. So, why the decline? As summer ends, many families return home, summer vacations are done and the kids are back in school. Add to that the fact that the holidays are coming; Thanksgiving, Christmas, New Years. As the holidays approach, Buyers focus more towards accommodating the festivities. However, they still haven’t left off the idea of buying that dream home in the mountains. Currently, many buyers want information on what’s available and how the market is doing. They will use the next couple of months to collect data and review finances. They will ask broker’s to send them what’s available. Then after the holidays, the purchases should begin again, as the past has shown. Remember, purchases that are made may not close nor show up for a couple months or better. That means the January and February Home Sales will start to show up around March and April. Some brokers will take clients homes off the market for the winter months, mistakenly thinking there are so few sales it’s not worth it to list a clients home. However, what they fail to realize is that the inventory is greatly reduced during these months. This gives Sellers an even greater advantage, in that they don’t have as many homes in which to compete. Fall is a great time to list your home, if you’d like to see it sold in the Spring contact this broker for more information. Not everything is changing in real estate for Highlands Cashiers Board of REALTORS®. While home sales have been doing quite well, land sales remain relatively flat. That is, land sales have not shown much change. Much of this has to do with the excess inventory. Here again, some land is moving, but very slowly. With nearly a 7 year inventory, prices for land will likely remain very low. This has nothing to do with what Brokers are trying to sell. It has everything to do with what Buyers desire. It’s Buyers that drive the market, not Brokers. So, how did we do in September? Total homes listed in Highlands/Cashiers MLS: 895 This is down by 300 homes compared with September of 2014. This reduction in inventory is great for Sellers. This means less competition for them and a better opportunity to see their home sold! Homes Sold This Month: 74 Same as August. The good news here is that we typically see a little dip in September. Average Unit Sales per Month/1 Year Average: 61 Although holding steady with August, last year the average was 54 home sales. So we still see an overall increase for the year. YOY Inventory: 14.67 months. Last year at this time the inventory was 22 months. Another significant change. Average DOM (YOY): 321 We are seeing a steady decline overall, especially since this number used to be around 400. Median Sales Price: $569,500. This is the highest Median price in YEARS!!! This is thanks to the number of homes over $1,000,000 that have been selling. Overall, buyers are purchasing higher end homes. Synopsis: The second home market is returning to this area. Buyers are beginning to purchase many higher end homes. Since the majority of homes in this area are second homes, Buyers are considered to be those with “disposable” incomes. That is, these homes are often considered a luxury. This would seem to indicate a better economy and trust. Although these Buyers are returning, this is still considered to be a Buyers Market. That is, the overall inventory is still high compared to the number of sales. We need inventory to reduce and sales to increase to enter what is considered a “normal” market. Synopsis: Realistically, one should not expect much in the way of home sales. With current sales being only about 1.5% of the inventory, the opportunity for selling any particular parcel is very slim. 34% of home sales ranged from $200,000 to $499,999. 26% of home sales ranged from $500,000 – $749,999. 21% of sales were above $1,000,000. The return of the $1,000,000+ home sales seems to have returned. These were almost dinosaurs for a while. BUYERS: There is still an opportunity to find some decent deals. These will fade quickly at current rates. In order to ensure you’re not paying to much, it would be wise to find a Broker that is also a Pricing Strategy Advisor (PSA). PSA’s are trained in the same techniques used by appraisers. This will help you to see a fair market price and they can assist you in making an offer. CONCLUSION: Real Estate is Fun again! There’s a confidence in owning property that you can enjoy. One should feel at ease if they use a Broker that is familiar with this market and its many nuances.